A typical wellhead consists of several valves to provide service functions required (Fig. 11). The master valve is for completely shutting off the well. 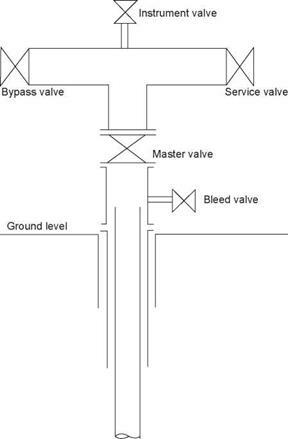 A small side valve is installed below the master valve to ‘‘bleed’’ the well when the main flow is shut off. It is not a good practice to completely shut in the well because the well may cool down and a column of cold water may sit in the well, preventing the well from discharging when the master valve is reopened. There may also be casing and cement damage from the thermal cycling. The well can flow again only when the column of water is removed by stimulation. Well stimulation is normally carried out by pumping air at the bottom of the well to airlift the flow. It can also be done by pumping steam or air into the well to depress the water column and then releasing the pressure quickly. Bleeding allows the well to stay hot. FIGURE 11 A typical wellhead and its valves’ arrangement. stream of the master valve. The service valve can be used for throttling, but long-term throttling of a well is normally done using a throttling orifice. The service valve is commonly installed vertically above the master valve. It can be used to admit an instrument such as a Kuster gauge. The instrument is first lowered to sit above the shut master valve. The instrument is hung on a stainless steel wire that runs through a gland packing. The master valve is opened only after the gland packing is in place. The flanged spool with the gland system is called the recovery tube. It is not common to make downhole measure­ments while a well is flowing. The instrument needs a long sinker bar to counter the buoyancy of the discharge. This means that a long recovery tube is needed. The flowing survey data are generally meaningful only if the well has a liquid feed zone of good permeability. silencer. For environmental reasons, discharge to waste via the silencer is not done unless necessary. The arrangement of the wellhead valves normally results in the top service valve being several metros above the casing head flange. Earlier designs were to install the casing head flange in a deep cellar or at ground level, and a platform was built to access the service valve. Nowadays, a deep cellar is not preferred because hydrogen sulfide and carbon dioxide, being heavier than air, can accumulate in such a cellar, causing a lethal hazard. The preferred option is to install the casing head flange at ground level and have a tee piece just above the master valve and the service valve on the horizontal pipework. A small instrument valve or a blind flange is installed on the tee piece directly above the master valve.